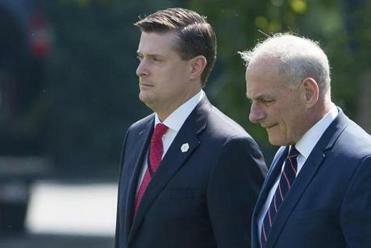 WASHINGTON (AP) — President Donald Trump said Friday that a former aide accused of domestic abuse by two ex-wives had done a ‘‘very good job’’ at the White House, adding, ‘‘We certainly wish him well.’’ Trump emphasized that former staff secretary Rob Porter maintains his innocence, and the president made no mention of the women who have reported physical and emotional abuse. The comments came the day after White House chief of staff John Kelly tried to assure staff that the Trump administrations takes domestic violence ‘‘very seriously’’ amid mounting questions about how Porter managed to maintain a position of high influence despite the allegations. The Porter crisis has damaged John Kelly’s credibility not only publicly but also inside the White House. ‘‘It’s fair to say we all could have done better over the last few hours or last few days in dealing with this situation,’’ said White House deputy press secretary Raj Shah, who faced a barrage of questions about Kelly during a press briefing Thursday. Shah said Thursday that Hicks later ‘‘recused’’ herself from some aspects of the matter, but it was unclear from what. Kelly, meanwhile, was Porter’s loudest defender, including in the first hours after the graphic photos of alleged abuse emerged.